Three MCDS students received awards in Wisconsin School Music Association (WSMA)’s 2019 Student Composition Project. 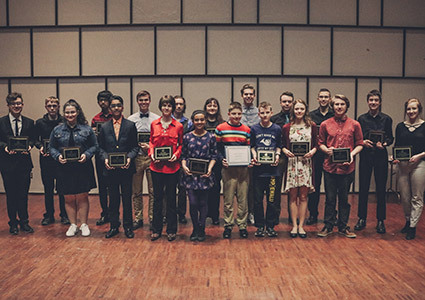 Jon Schipper’s students Eleri ’19 and James ’22, and Philip Tietze’s student Rhea ’24, were recognized for outstanding achievement with their original musical work during a special awards program at UW-Whitewater on March 30. In the High School Division (Grades 9-12), Eleri’s piece Percusio received First Place in the Instrumental Miscellaneous category, and James’s piece Across the Map received Honorable Mention in the Instrumental Ensemble category. In the Middle School Division (Grades 5-8), Rhea’s piece Rendezvous with Nostalgia received Second Place in the Instrumental Ensemble category. This year a total of 71 submissions were received for the project with 51 submissions in the High School Division and 22 in the Middle School Division. Five submissions received Honorable Mention distinctions and 35 submissions received awards based on merit in 10 different categories. The Student Composition Project provides student composers the opportunity to receive feedback regarding the positive qualities of his/her piece as well as provide ways to improve as a composer in the future. Each submission is reviewed and receives a written critique by a professional composer. Reviewers determine awards and winners. Division winners receive a scholarship to study composition. For more information visit https://wsmamusic.org/press/wsma-honors-student-composers/.